Not to be confused with Kremling. The Kremlin (Russian: Московский Кремль, Moskovskiĭ Kremlʹ) is a complex in Moscow and one of the city's landmarks that Luigi has to visit in Mario is Missing! in order to rescue the city from Koopa Troopas. In the NES version, the Koopa Troopas steal the Emperor's Bell, whereas in the SNES version, they steal a Cannonball from the Tsar Cannon. In either case, the Kremlin is closed down, and Luigi is tasked with returning the item to the Kremlin's information booth, where he has to answer questions to prove their genuineness, seen below. 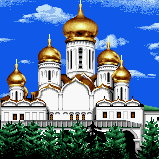 In the DOS and Deluxe versions, the Kremlin does not appear; the Moscow Metro and Lenin's Tomb appear instead. How long has that bell been in the Kremlin? How much does the bell weigh? Who had the bell placed in the tower? Whose image appears on the cannon? The cannon is the ____ in the world. The Emperor's Cannon, in the Kremlin, is known in Russian as Tsar Pushka. It is the biggest cannon in the world, with a caliber of 35 inches. Its barrel is 17.5 feet long. The cannon was cast in 1586 by Andrey Shchokhov[sic] and weighs a total of 40 tons. On the barrel is a likeness of Tsar Fyodor Ivanovich. This page was last edited on November 11, 2018, at 20:25.